Industrial Strength* hypoallergenic titanium labret posts with 3mm or 5mm disks. 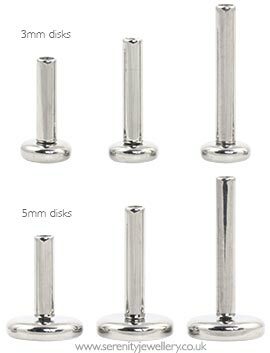 These posts are internally threaded for comfort during insertion with no risk of exposed threads catching or tearing the inside of your piercing. This is particularly good for new or irritated piercings. 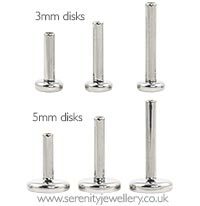 The posts with 3mm disks can be a bit more fiddly to put in but are good if your piercing is near to the edge of your ear where a 5mm disk might be more visible. 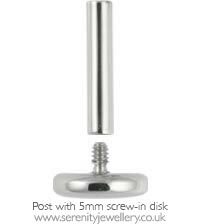 PLEASE NOTE these posts are for use with Industrial Strength 1mm/1.2mm gauge screw-in accessories only. The threads will not work with any other jewellery brands. 1mm/18 gauge labrets are good if your piercings have shrunk or were originally pierced with a smaller size. The 1mm gauge posts have a fixed disk which means the labret has to be put in from the back of the piercing. I absolutely love these! The shine and the rounded design is so comfortable and pretty. Perfect labret and fast free shipping! I love these posts! Very comfortable!!! I found this a little fiddly to get in as I wear it in my nose, but once in it's so comfortable. Excellent quality as you'd expect from a high end brand. I have a 1.0mm piercing in the root of my helix and have struggled previously to find the right size jewellery for it. Really good to find a high quality 4.7mm post that fits snugly and no longer causes the piercing to be twisted. Definitely happy with this purchase. High quality jewellery, they go well in my lobe and tragus piercings (length: 8mm). And really comfortable to wear. Absolutely delighted with the quality of this jewellery and the incredibly swift delivery. Beautifully finished and worth the (slightly) higher cost.